Saturday, April 20th 12:00 P.M. 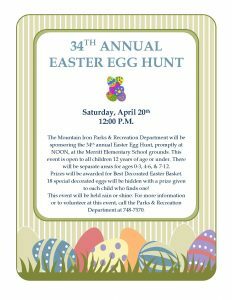 The Mountain Iron Parks & Recreation Department will be sponsoring the 34th annual Easter Egg Hunt, promptly at NOON, at the Merritt Elementary School grounds. This event is open to all children 12 years of age or under. There will be separate areas for ages 0-3, 4-6, & 7-12. Prizes will be awarded for Best Decorated Easter Basket. 18 special decorated eggs will be hidden with a prize given to each child who finds one! This event will be held rain or shine. For more information or to volunteer at this event, call the Parks & Recreation Department at 748-7570.